Have you ever felt overwhelmed while running your e-commerce store? E-commerce businesses are complex operations. Between fulfilling orders, managing inventories and running promotions, you have your work cut out for you. A point comes when email and spreadsheets just don’t cut it. You need something more comprehensive and cohesive. A single place to keep track of everything and map out your progress. This is where project management software comes in. In fact, we spoke to a number of merchants about their biggest challenges. Managing projects was almost unanimously one of the top concerns. Keeping all this in mind, we decided to take some of the most popular project management tools on the market for a test drive. Managing efficiencies is one of the hallmarks of the e-commerce business. How you deal with your day-to-day operations impacts everything from customer support to order fulfillment. Project management (PM) software promises to help you keep track of everything related to your business — key files, communication, project progress, etc. Project management software give you a centralized place to share files and communicate with team members. This makes marketing operations much smoother to run. For e-commerce stores, customer support hinges on speed. How fast you can resolve customer complaints will determine customer satisfaction level. With PM software you can automatically create to-dos with each new support request. You can then track the progress of each request and the time taken to resolve it. Managing and fulfilling orders often involves recurring tasks. PM software gives you the ability to not just track the progress of each order (“In Process”, Shipped, Delivered), but also create recurring to-do lists for each order. Of course, once you start using project management software, you’ll find plenty of other uses as well, from managing product launches to delegating tasks. What to Look for in E-Commerce Project Management Software? The business software directory G2Crowd shows 222 different tools when you search for project management software. With such a wide range to choose from, how do you select the right software for your e-commerce store? Complexity: A number of PM tools such as JIRA and Clarizen are designed for enterprise customers. This makes them powerful, but also exceptionally complex and costly (Clarizen, for instance, costs $45/user). Look for something small, yet capable enough for small e-commerce store needs. Cost: As a small e-commerce business, you shouldn’t have to spend anything beyond $100/month for all your team. Most tools in this category cost under $10/user. Cloud-based: Unless you have your own servers and IT team, you should only pick cloud-based solutions that you can access from a browser. Speed: E-commerce businesses move fast; your project management software should do as well. Look quick loading times and rapid task switching. Store integration: Although not necessary, a PM tool that integrates with your e-commerce store is always preferable to one that doesn’t. Beyond these, also look for feature availability, support and design. Based on these factors, we’ve compiled a list of the best project management software for e-commerce stores below. 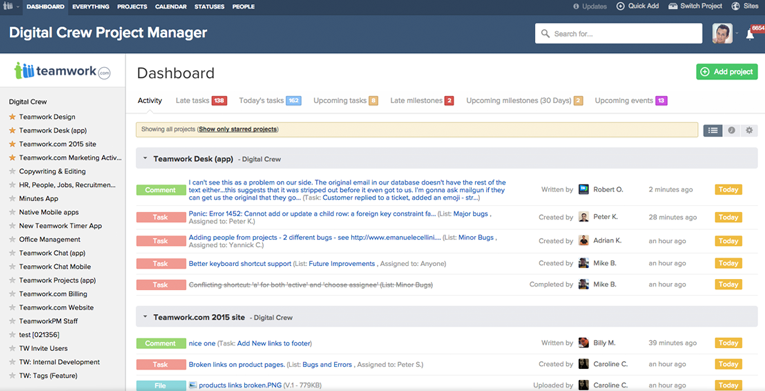 Trello uses the Kanban methodology of project management. This methodology involves moves a task along a series of cards as it nears completion. Since it is highly visual, the Kanban methodology is ideal for a range of tasks. With Trello, you can create separate boards for each aspect of your business (such as Marketing or Inventory Management). Within each board, you can create different cards signifying a task’s current stage (such as To Do, In Process, Finished). After adding a task, you can drag-drop it from one card to the next based on its current stage. You can also assign a task to a team member, add attachments and leave comments. 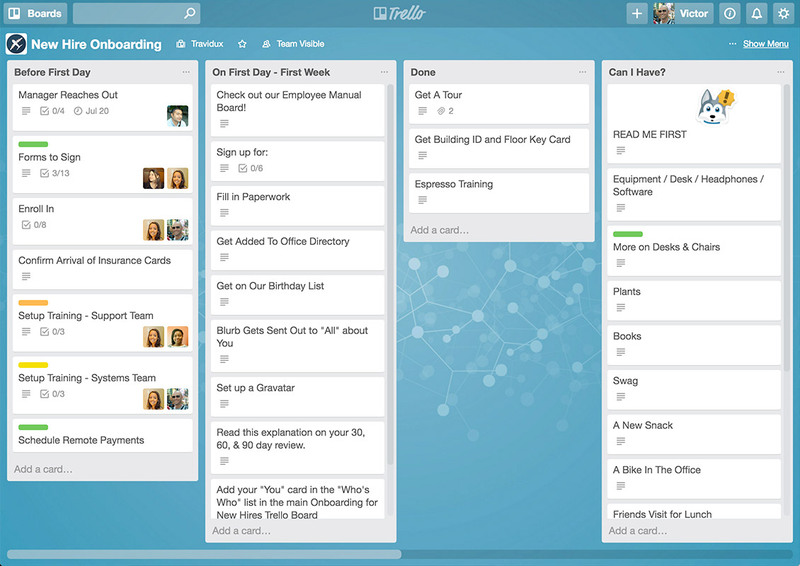 Trello’s biggest advantage is its flexibility and ease of use. You can get started in seconds and use the software for virtually anything — managing your inventory, gathering ideas for your blog, and maintaining a to-do list. The ease of use is also Trello’s biggest disadvantage. The Kanban methodology is hard to scale for complex, non-repeating tasks. Trello’s support is also limited unless you spring for the Enterprise plan ($20.83/month). Not ideal for complex e-commerce related operations such as managing recurring tasks, keeping track of time for support requests, etc. Trello is free to use. You can buy a Business plan that includes additional features and integrations for $9.99/user/month. Summary: Trello’s ease of use and price (free) makes it a great tool for those new to project management. The Kanban methodology is flexible for a wide variety of projects. However, for complex projects, you’ll want to use something more feature-rich. 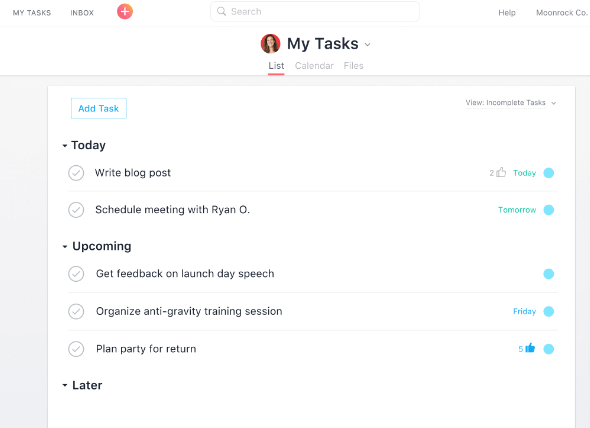 Asana is a project management software from Dustin Moskovitz, one of the co-founders of Facebook. It’s one of the more popular PM tools around with over a million users, thanks in no small part to its popularity among startups. Asana’s project management centers around individual projects, each of which can have different team members. You can add any number of tasks to a project. The due date and priority for each task will show up in the Team Calendar. You can also leave comments and chat with team members inside Asana. The Inbox helps you keep track of all of your followed tasks. Asana’s flexibility makes it ideal for any business regardless of its size. The segregation of workspaces and calendars means you can accommodate anywhere from 1 to 100+ people on it. The visually stunning design is also a pleasure to use. Highly flexible; can be used for any number of activities. 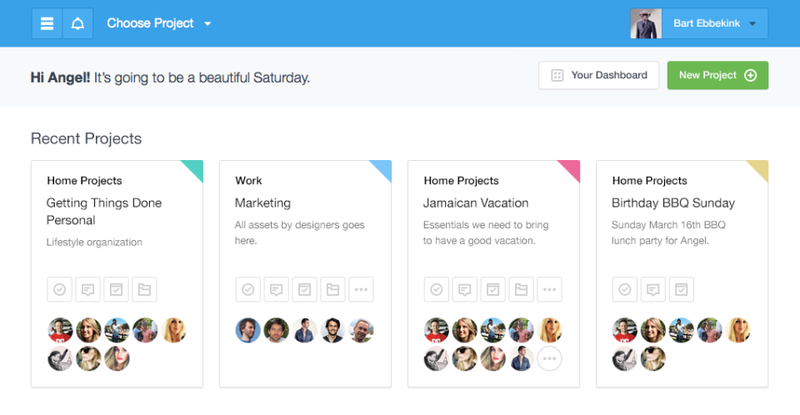 Asana offers a fully-featured free plan. For just $6.25/user/month, you get a number of additional features. 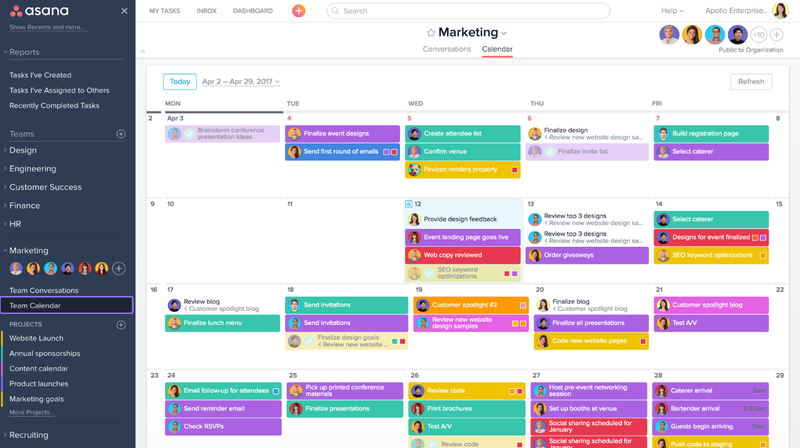 Summary: Asana is free and easy to use with a long list of features for collaboration and project management. It is also extremely flexible, suitable for solopreneurs as well as businesses with 100+ employees. As one of the pioneers in the online collaboration space, Basecamp has a long list of loyal users. Built from the ground up for small businesses, Basecamp is exceptionally friendly with a philosophy of less is more design. Schedule, to replace personal calendars. While not strictly a project management tool, these collaboration features work well for small e-commerce businesses, especially if you have a growing team. The single-dashboard communication capabilities make it easy to keep tabs on what your team is doing. On the downside, there is no visual way to track project progress. The to-do lists work well for micro-managing, but misses the big picture of managing complex tasks. Basecamp has a free trial. Once the trial ends, you can purchase a paid plan starting at $99/month. And it’s free for teachers and students. 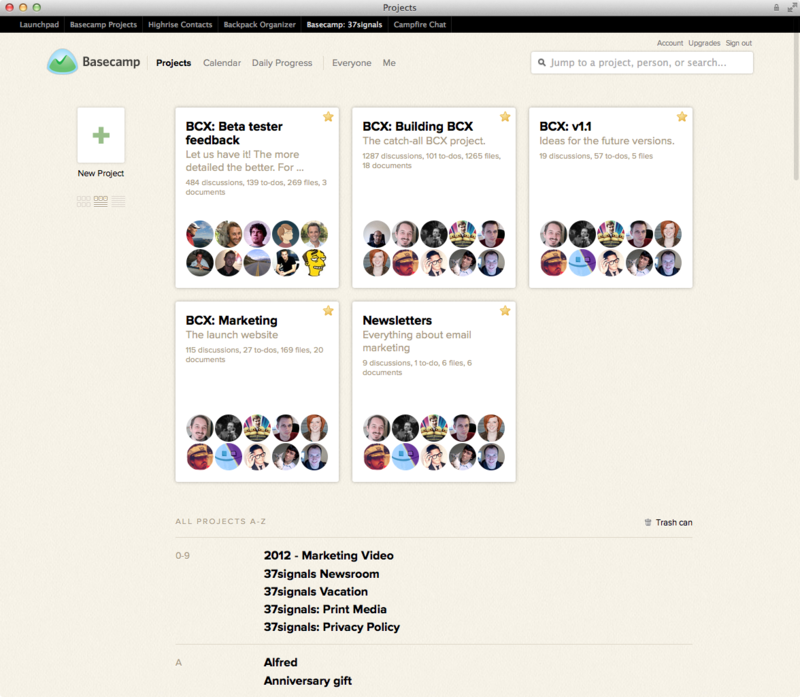 Summary: Basecamp’s collaboration features are second to none. The email and chat replacement tools make communication much more streamlined. However, it lacks project management capabilities and isn’t ideal for complex e-commerce projects. Unlike the other three tools above, Wrike is a full-featured project management software designed for large teams. As such, it has an exhaustive list of features for managing complex projects. Wrike’s workflow revolves around breaking each project into its small tasks. 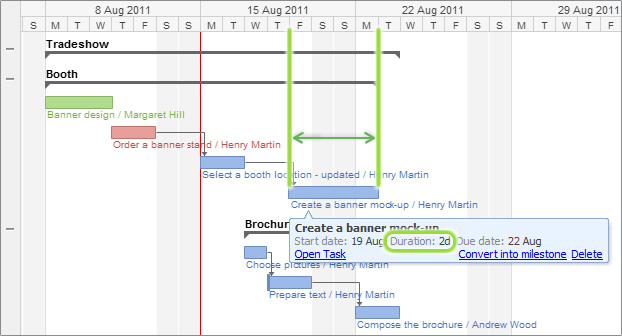 You can then keep track of these tasks via lists, boards, or even visual timelines (Gantt charts). You also get live file editing and collaboration from within Wrike itself. There are also automated templates and request forms for collecting data from outside requesters (such as support queries from customers). Additionally, you can keep track of budgets and time spent on each task by each user. This is ideal for keeping track of support requests or managing time-intensive activities such as inventory management. This laundry list of features is Wrike’s biggest advantage but also its Achilles’ heel. Some e-commerce businesses might feel overwhelmed with the feature set. Long list of features, including visual timelines, file editing, automated request forms, etc. Best-in-class security features such as role-based access controls and data authentication. Wrike offers a free plan, though you’ll want to upgrade to the Professional plan ($9.80/month) at least to get the most from it. Summary: If you’re just starting out, Wrike might be a bit too complex for your needs. However, if you’re in the growth stage and have a team of 15+ people, Wrike’s features will radically enhance your productivity. Teamwork is another full-featured project management software designed for large teams. As such, it has a long list of features but poor usability and ease of use. Using Teamwork follows the same process as Asana or Wrike: create a new project, break it down into small tasks, assign people to each task, then use Teamwork to keep track of progress. Where Teamwork excels is in giving you a macro overview of your project progress. Instead of spending time managing small tasks, you can zoom out and get a broad overview of your project through Gantt charts. Teamwork includes a Trello-like Kanban board to manage and track progress visually. Although Teamwork can be used for any business, its feature-set (such as portfolios and time tracking) complements product and marketing companies best. mall e-commerce stores might also find the software too difficult to use. Teamwork does not have a free plan. You can get a subscription for $69/month with no restrictions on the number of users. Additional plans are available from $169/month. Summary: Teamwork is great if you’ve already used simple project management software and want to upgrade to a better alternative. If you’re new to project management, however, you’ll do better with a simpler tool. Freedcamp is an entirely free solution similart to Trello and Asana. With a user-friendly design and plenty of features, it is a great solution for e-commerce businesses starting out with project management software. 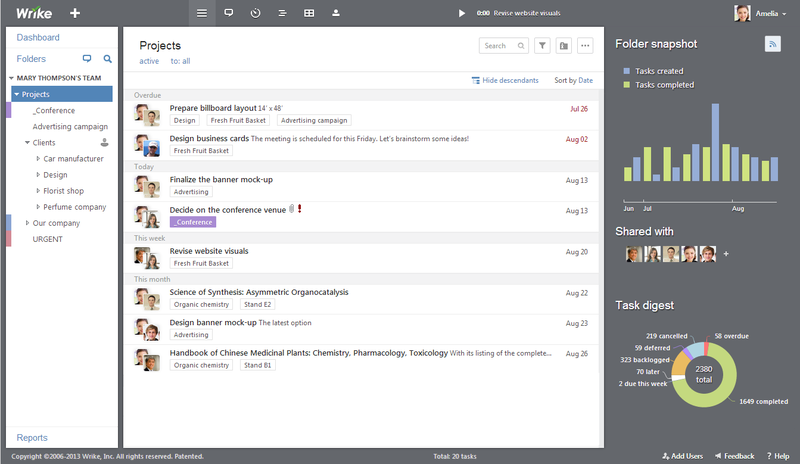 Freedcamp is organized around tasks. You create a new project, add your tasks (along with their due dates and priorities), and assign people to them. Freedcamp gives you a number of ways to visualize and track progress for each task, including a Kanban board and a calendar. Besides task tracking, Freedcamp also gives you a single dashboard to hold team discussions and manage files. The latter is particularly useful for running e-commerce marketing campaigns. In addition to these, you can also install extra applications such as milestone tracking, time tracking, etc. Freedcamp’s strength is its ease of use and intuitiveness. You can get started without having to read any tutorials at all. It is also free to use, though there are paid plans with more features. Freedcamp is entirely free to use. However, you can upgrade for more features starting at just $5.99/month. Summary: Freedcamp is a great starter solution for e-commerce businesses new to project management. It includes all the features you’ll need to manage your store. Once your store grows, you can upgrade to a more feature-rich software. E-commerce businesses have very specific needs from their project management solutions. Given the fast-paced nature of e-commerce, you need something that is easy to use, fast, yet feature-rich enough to support complex projects. The six solutions we’ve shared above vary in their complexity, cost and ease of use. Pick a free project management software such as Trello or Asana if you’re just starting out. Once your needs expand, choose a full-featured solution such as Teamwork or Wrike. How do you manage your e-commerce store? We’d love to know your favorite project management tools and tactics!